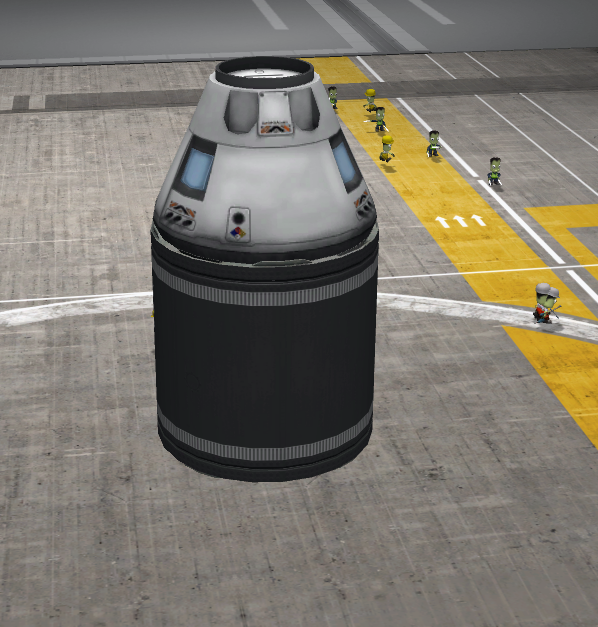 TweakScale lets you change the size of a part. Not just that, but it will figure out how much fuel is in the resized part. And if it's an engine, it will become more powerful by scaling it bigger, or weaker by scaling it smaller. This plugin was initially made by Gaius Goodspeed, and I heartily recommend you also take a look at his parts. TweakScale is already used by Gaius' parts above, and ZodiusInfuser's Infernal Robotics model rework, which I also recommend to anyone who likes having fun. TweakScale is made available under the terms of the Creative Commons Attribution-NonCommercial-ShareAlike license. From Version 1.5.0.1, KSPAPIExtensions.dll should no longer reside in GameData, but in Gamedata/TweakScale/Plugins. If you have a KSPAPIExtensions.dll in your Gamedata/ folder, please delete it. 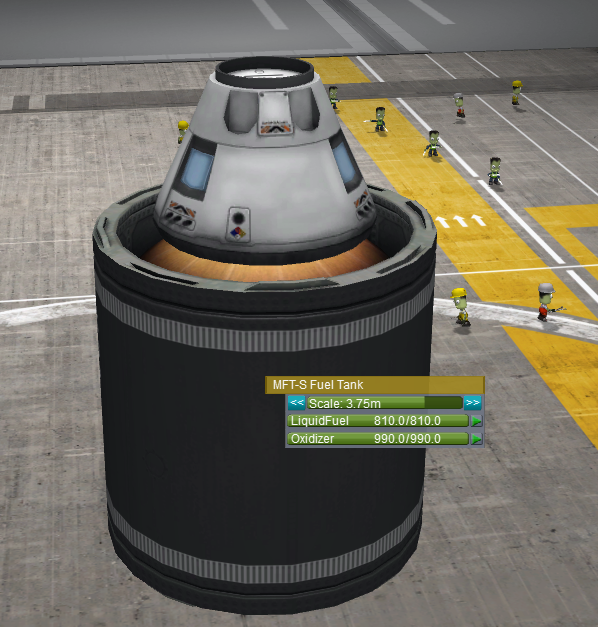 Please add TweakScale to your mod! Please place your TweakScale .cfgs in your mod's folder, not in the TweakScale folder. This way users can delete TweakScale and install a new version without breaking your mod. If your mod is already on the list of supported mods, please post here or PM me, and I will remove support, giving you full control over the .cfgs. You as the author of a part or addon get complete control over which parts you want to offer in which sizes. 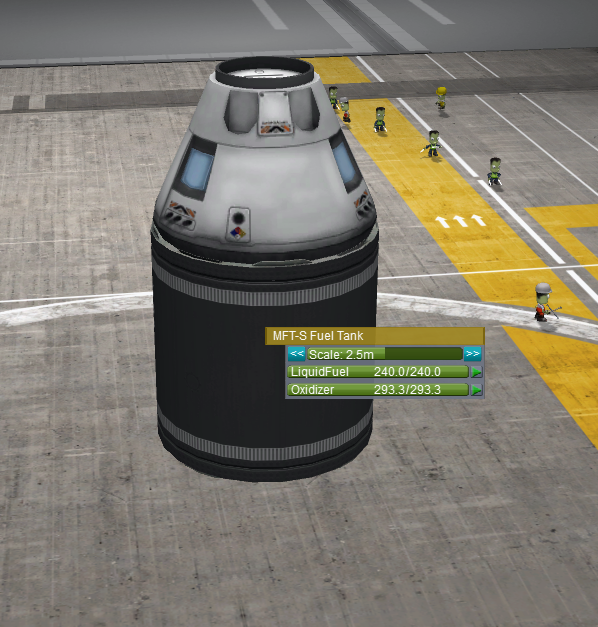 Should that fuel tank only be available in size 2.5m and 3.75m? Make it so! That RCS thruster on the other hand, could be scalable freely between half regular scale and double regular scale. For heavy, solid parts, mass increases with the cube of the scale - you scale it in three dimensions, after all. For parts that are a thin layer of aluminium plates over a rigid skeleton - like fairings, crew compartments, empty fuel tanks - mass probably scales closer to the square of the scale. Engines, RCS thrusters, fuel tanks, boosters, reaction wheels, air intakes, control surfaces and solar panels are supported, and have their physical properties updated to sensible values when rescaled. See how it says 3.75m? 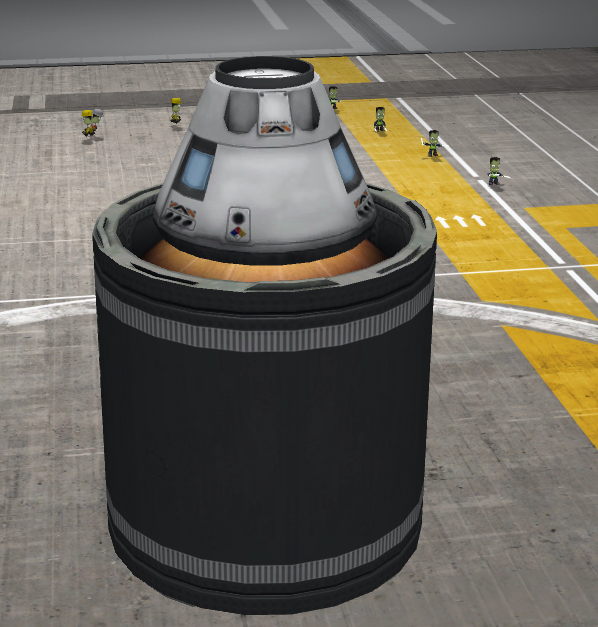 Well, the command capsule is 2.5m, so let's change it. You do this by pressing the << >> buttons or dragging the slider. See how well it fits? As you can see the scale type uses the same names as the module definition, and they can even inherit from other scale types (if you want to change just a small detail). When a user rescales a part with a MyPartModule module, TweakScale will automatically update the flooberRate of the part with the square of the scale (so if it's a 2.5m part and it's scaled to 3.75m, the flooberRate will be 2.25 times its usual value [3.75/2.5 = 1.5; 1.5^2 = 2.25]). The above config will scale all members of the list outputList on ModuleGenerator, to the cube of the current scale. The above would scale ModuleMyModule.foo[x].bar.quxRate. Here, each option in the stack SCALETYPE will be unlocked by a corresponding tech. If there are fewer techRequired than scaleNames/scaleFactors, the unmatched scales will be unlocked by default. Here, a 62.5cm version would have a maxThrust of 1, 1.25m would be 2, and so on until the 5m version has a maxThrust of 5. ScalingFactor has the properties 'absolute' and 'relative'. Most likely, you want to use absolute. relative is the change in scale since last time OnRescale was called, while absolute is the change in scale in relation to defaultScale. absolute and relative have properties linear, quadratic, cubic and squareRoot, which are shorthands for different scaling factors. Due to limitations in .NET, an IRescalable either has to be implemented in an assembly of its own, or the entire assembly will be made dependent on TweakScale. For an example implementation, check out how Real Fuels support is implemented. New algorithm for rescaling attach nodes. Tell me what you think! Added Deadly Reentry Continued and Large Structural/Station Components. Added support for tech requirements for non-freeScale parts. Factored out Real Fuels and Modular Fuel Tanks support to separate dlls. Fixed bug where attachment nodes were incorrectly scaled after reloading. This time with more fix! Added support for Near Future Technologies. Fixed bug where attachment nodes were incorrectly scaled after reloading. Finally squished the bug where crafts wouldn't load correctly. This bug is present in 1.13 and 1.14, and affects certain parts from Spaceplane+, MechJeb, and KAX. Added support for MechJeb, Kerbal Aircraft eXpanion, Spaceplane+, Stack eXTensions, Kerbal Attachment System, Lack Luster Labs, Firespitter, Taverio's Pizza and Aerospace, Better RoveMates, and Sum Dum Heavy Industries Service Module System. Fixed a bug where Modular Fuel Tanks were not correctly updated. No longer scaling heatDissipation, which I was informed was a mistake. Removed silly requirement of 'name = *' for updating all elements of a list. Added .cfg controlled scaling of Part fields. Added support for nested fields. Fixed a bug where rescaleFactor caused erroneous scaling. Added (some) support for Kethane parts. Removed spurious debug log printing. You can now use a list of value instead of an exponent! Fixed erroneous scale for Rockomax 48-7S, and added missing scale for KW Rocketry 2.5m Nose Cone. Fixed a problem where parts were scaled back to their default scale after loading, duplicating and changing scenes. Fixed a bug in 1.5 where scale was not correctly preserved. Updated KSPAPIExtensions.dll - please delete the version in GameData/. Changed from hardcoded updaters to a system using .cfgs. Made registration of custom IRescalables possible. Fixes compatibility with GoodspeedTweakScale (but not old versions of TweakScale, but that should be a much, much smaller problem anyway). Added scaling support for KW Rocketry, NovaPunch and KSP Interstellar. Fixed a bug where parts would get rescaled to stupid sizes after loading. Breaks compatibility with old version of the plugin (pre-1.0) and GoodspeedTweakScale. Fixed default scale for freeScale parts. Fixed node sizes, which could get absolutely redonkulous. Probably not perfect now either. B9 Aerospace, Talisar's Cargo Transportation Solutions, and NASA Module Manager configs. Now does scaling at onload, removing the problem where the rockets gets embedded in the ground and forcibly eject at launch. Fixed a silly bug in surface scale type. Added scaling support for B9 Aerospace and Talisar's Cargo Transportation Solutions. Will now correctly load (some) save games using an older version of the plugin. More mods should be supported. I'm open to suggestions. Enlarged engines burn too hot. Exhaust trails are the wrong size. I think. Support for more modules (addons)? Tech tree support (unlock sizes). Suboptimal interactions with Procedural Parts and Procedural Fairings - parts may intersect after loading. I have no idea how FAR feels about the updating of drag and lift. Apparently tweakable everything with TweakScale causes problems (ref post 200). More information needed. Fairings may be erroneously scaled (ref post 22) Unable to replicate. I'd love to have a .craft file showing this problem. Do what Taverius says about engines and possibly other stuff. kolago (post 144) would like to see what the rescaled values are. Still on the fence about this. The mod completely breaks the game if you open up the menu on one of the lander/rover command pods. When you open the menu it goes up and down infinitely and doesn't allow you to open up menu's on other parts. Hello, i have a problem with this mod, when i rescale a command pod with any crew capacity, it doesn't work and i am not able to add more crew int the cabin. Can someone help me to fix this ? Tell me please. With which mod can change the length and radius of the part. As you can see here https://www.youtube.com/watch?v=6uHgWpAh30s&amp;feature=youtu.be&amp;t=2m1s and here https://cs6.pikabu.ru/post_img/2017/05/26/2/1495757114125780943.png. Sorry for my English. This mod is so amazing and I am exceptionally grateful for it. I am a very vanilla player, and this lets me do so much more with my game without downloading a lot of new parts. It works on my v1.3 perfectly. One suggestion: Is there any way to scale the engine effects when you scale the engine? I have some big nukes on my new interplanetary spacecraft, but the exhaust looks the same no matter how big the engine is. I tested it. It works perfectly fine in 1.3, go and download it! 1.3 pls. I need this mod. When will it update to 1.3? With the update to 1.2, I don't think the aerodynamic effects of fins are scaling. When adding a fin/canard/control surface to my craft, the mass scales properly but there seems to be no change in the aerodynamic effects even scaling the parts to their max size. I can see the center of gravity move when increasing the size but the center of lift doesn't move. For some reason fixed wings are aerodynamically scaling well, but anything with a moving control surface doesn't seem to change.